Don’t Let Dreamkillers Kill You! 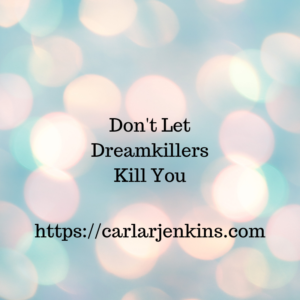 Posted bycarlarjenkins	 February 3, 2019 February 3, 2019 Leave a comment on Don’t Let Dreamkillers Kill You! You have big dreams and aspirations for yourself. You believe – no – you KNOW that you are destined for more and determined to do better. However, not everyone is in your corner. Here is my advice to you : don’t let dreamkillers kill you! Subscribe to get our latest positive change content by email. 45 Days In. Have You Made Them Count? Yes It is March Already. How Well Are You Doing 60 Days In? Michele Morin on October is Positive Attitude Month! carlarjenkins on Want More Opportunity? Here’s How! Positivitychange, Proudly powered by WordPress.